Choosing and buying a golf glove takes a bit of know-how and some times to figure out a good fit. Most golfers don't give much thought to the golf gloves they buy, even though they're the only thing between them and their grip when they hit a shot. Some wear gloves that are too big, while others almost rip the glove when they pull it up on their hands because it is too small. Choosing a golf glove takes knowledge about both what a glove is made of, as well as the properties of a well-fitting glove. Determine which glove material you prefer. Although leather is more expensive, a leather glove is simply more comfortable to wear and tends to last longer. But synthetic gloves have their advantages, too. For instance, when the weather is hot or it's raining, gloves made of synthetic materials provide a better grip on the club. For that reason, experienced players will have both types in their golf bag and wear either one depending on the weather. Make sure your golf glove fits you tightly on all areas of your hand. They come in numerous sizes for both ladies and men, and are even offered in so-called “cadet” sizes for wider hands as well. There should be little material between the ends of your fingers; too much would indicate that the glove is too big for you. Make sure that the glove fits smoothly both in the palm of your hand and on the back. Put on your glove the right way. First, insert all fingers but your thumb into the glove and pull it all the way onto your fingers. Then, place your thumb inside the glove and gently smooth the front and back surfaces by pulling on the top of the glove. Close it by either attaching the snap or using the Velcro closure. Look for a golf glove that meets your needs. 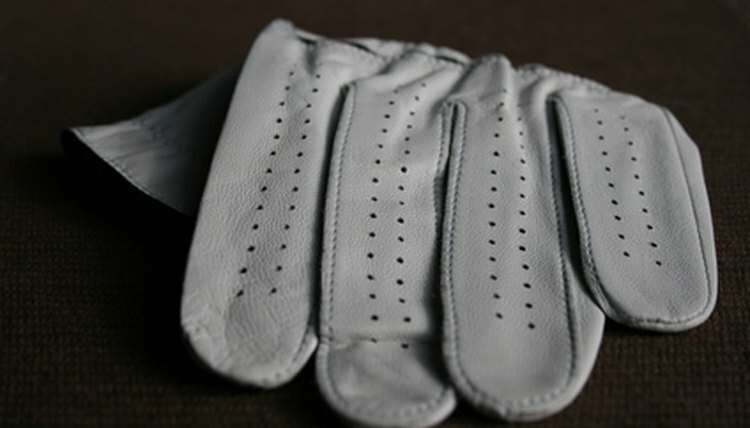 For instance, there are golf gloves that have detachable discs to mark your golf ball on the green. You'll even find half-gloves that expose the fingers to give you more feel of the shot. Finally, if you like the feel of leather but cannot afford it, there are gloves made with leather in the palms and synthetic material on the backs. And if you are into style on the golf course, there's a colored glove to wear with virtually any outfit. Pay $6 or $7 for the cheapest golf glove or invest about $25 in the best ones on the market. You'll find golf gloves at your local pro shop or local sporting goods store. You can also buy them online (see Resources section below).